Guitar building supplies are available to help students, readers and viewers build guitars using my methods as described in my book and dvd. I have put together all the things that I have developed and all the things that are tough to find including all the wood needed to make the entire guitar. The guitar building supplies include clear acrylic templates make layout and grain selection a breeze. Molds are available to create the laminated sides and linings as described in the book and video. An assortment of luthier tools that I have developed are available include the Buzz-Off® Fret Leveling Kit, rosette cutting router attachment, adjustable tuning jig, sanding pads and radius sticks and more. There is a classical guitar solera work-board kit available which will help make one of of these so much easier. There are also an assortment of guitar building kits available. Products have been bundled together for a savings, including the wood! All plans have been drawn in a Cad program for accuracy. Plans come rolled in a tube. Guitar Plans – Plans for the guitars in both the book and the dvd are available in both printed and downloadable versions. All guitar plans are full size drawings and include the clear acrylic acetates for laying out the top and back. The plans are also available as a digital download. Jig & Fixture Plans -Plans for the binding/purfling cutter router attachment originally appeared in the book but have been redone for clarity and an assembled view was added. Plans for the heel cutting jig and the side slot cutting sled are available packaged together. The side slot cutting sled is for cutting the side slots in the neck on a table saw. The side slot cutting sled will work for any scale length guitar without adjustment. The heel cutting jig is for cutting the cheeks of the inside heel block on a band saw. Both are also available as a digital download. All templates are created on a CNC machine for precision accuracy. These templates are difficult to create accurately by hand. Any inaccuracy in the templates can multiply as you progress through the guitar building process since everything starts with the template. Guitar shape is that of a ’43 Hauser. Templates work with book and DVD. Classical guitar template set – includes templates for the plantilla, headpiece, fingerboard, bridge patch, and a 2 1/2″ piece of brass dowel for registration pins. Template set works with book or DVD. Both the headpiece and fingerboard templates are 1/4″ thick and may also serve as router guides to cut the parts. The plantilla, fingerboard and bridge patch templates have 1/8″ registration holes and a scribed center line center line to facilitate easy alignment. The templates are made of clear acrylic. The ability to see through these templates is very beneficial when selecting graphics for a top, back, or a headpiece veneer. Templates come with instructions. Fret slotting template – allow you to slot your fingerboard with two fret slotting options, the standard rule of 18 fret positioning, and a compensated fret positioning I use in the classical guitar making book and 10-DVD box set. The compensated positioning yields a slightly better approximation for improved intonation up and down the fingerboard. All molds are created on a CNC machine for precision accuracy. The molds are used to laminate the guitar sides and linings, to install the linings, and to create a sheet of purfling material. These molds are difficult to create accurately by hand. Any shape mismatch will prevent the parts from fitting together without force which will introduce stress. Guitar shape is that of a ’43 Hauser. Molds and cauls work with book and DVD. Get more information about the benefits of laminating guitar sides. Side Molds – Molds will give you consistent results when creating your guitar sides. The mold will produce sides that are very stiff and adhere to the exact shape of the plantilla. Lining Molds – Laminating linings creates a solid set of linings that are superior in every way to any other type of guitar lining. Laminated linings fit the sides very well eliminating stress and the possibility of misshapen sides. They are also stiffer, easy to install and they produce a guitar with a focused sound. If mahogany is used there will be almost no visible glue line an look like a solid piece of wood. Glue Cauls for Molds – Cauls distribute the clamp pressure and prevent damage to the surface of whatever you are gluing. The classical guitar mold kit includes a caul kit that has all the material you need to create the side mold caul and the caul used to install the linings. The cauls are available straight or pre-bent. Straight cauls can be bent to fit any shape guitar mold. Mold and cauls come with instructions. The guitar making kits were put together so customers can get everything they need at a savings. The kits come in two flavors, master kits and premium kits. The master kits contain everything you need and the premium kits contain just the essential ingredients. The main difference is the master kits come with the solera kit, the premium kits do not. 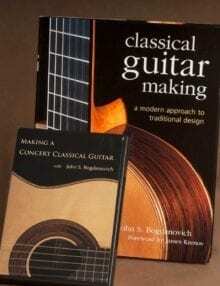 The guitar in the book can be considered an introductory level guitar making project. This guitar is geared toward first time guitar builder. This does not mean its an easy project or a lesser guitar. 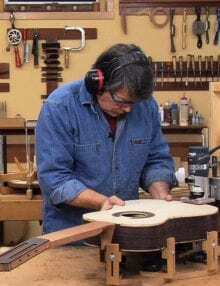 It simply means the the guitar design and the techniques used to construct the guitar are geared toward someone little guitar building experience, and a minimally equipped shop. Introductory level master and premium kits are available. The guitar in the DVD can be considered an advanced level guitar making project. This guitar is design is a bit more challenging to execute and power tool techniques are demonstrated in the DVD for some of the tasks. This project is for those with some woodworking or guitar building experience and a little more than a minimally equipped shop. Advanced level master and premium kits are available. The advanced master kit includes the fret lotting kit. This kit will enable you to slot your fingerboards on a table saw. All products in both kits are the same and can be used on both the guitar in the book or the dvd. Over the years I have developed a few tools that I use for guitar building. I use these tools in my shop every day. They make my life easier. Maybe they can help make yours easier too. 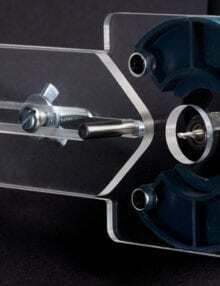 The 2-Pi Rosette Cutting Router Attachment is made on a CNC machine for accuracy. The sanding blocks for the Buzz-Off® Fret Leveling Kit, the tuner drilling jig, radius sticks and radiused sanding pads are all made by hand in the shop. The Buzz-Off® Fret Leveling Kit was developed to do fret leveling on my guitars after construction prior to set-up. The results I got leveling with the kit made for an ultimate set-up on the guitars. Fret leveling with the kit made it possible to level al the frets and get an optimal set up without a lot of adjusting after stringing up the guitar. I decided to offer the kit as a product. Get more information and a demonstration video here. Leveling with the kit is so easy anyone can do it. Whether you are a repair person, guitar builder, or a player, getting rid of annoying fret buzz can be a breeze. The kit will help find and eliminate fret buzz caused by having a high fret. It will not fix a warped or improperly set neck. For that kind of repair see a qualified repair person. The metal dowels can detect a high fret that is only .001 or .002″ high. The kit is now available for classical, acoustic, electric guitars and ukuleles. 2-Pi Cutter Router Attachment – this attachment can be mounted on any laminate trimming router to install any type of guitar rosette, cut out the sound holes, and create round patches. This versatile attachment is fully adjustable. It will cut a circular pattern with a maximum diameter of 7″ and a minimum diameter of 3/4″. The rosette inlay router attachment is easy to mount. Use the removable base of your router as a template to drill the holes. Watch a video demonstration of how to mount the attachment. An improvement has been recently made to make adjustment easier and minimize slippage. Now you can adjust the cutting diameter without taking the router off the work piece. Adjustable Classical Guitar Tuner Drilling Jig – is used to drill 35mm on center holes for rollers on classical guitar tuning machines which is the most common tuning machine roller spacing. Out of the box it will enable you to drill holes for StewMac’s bronze leaf and stippled brass Sloane tuners. The drilling jig is designed to work with headpiece template in place. This will save time and provide accuracy in placement of your tuners. Watch a video demonstration of how the adjustable classical guitar tuner drilling jig. 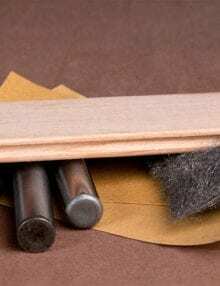 Radius sticks and sanding pads – these items are used in creating the dished work boards. Use the sanding pads to final shape the dish and the radius sticks to check you shape. They both have a a 15′ and a 25 radius component. 15’and 25′ radius’ are the most common radius’ for the guitar back and top respectively. The 25′ radius sanding pad can also be used to shape the bottom of the bridge to fit the dome of the top. Glue bottle and roller – Get glue on evenly. For small surfaces like edges when plate joining the glue bottle is idea. It size makes it comfortable and easy to use. It makes it easy to get the right amount of glue on the surface. For spreading glue on large surfaces nothing beats the glue roller. I have been using a roller since my furniture making days. It is hands down the best way to spread glue quickly and evenly on a large surface. Without a good solera, you cannot build a good guitar. Care must be taken to build the solera accurately. Once built, the solera has to be stable or all your hard work is for naught. For stability the solera is a honeycombed(making it lighter for shipping) piece of MDF sandwiched between two sheets of 3-3.5mm thick hardwood veneer.The veneer is thick enough to plane your neck ramp in without cutting into the MDF. MDF has a tendency to warp if the outer surface has been cut through. The solera kit comes partially assembled. The kit includes a pre-drilled set of rims, basswood patches for the upper and lower bout, all the hardware necessary and the solera itself. The solera will still be as accurate as it was when you shaped it for years to come. I have been using mine for over 10 years now. Rims are also available separately.